Square Plate W/ Striped Rim 8 1/4"
Rect. 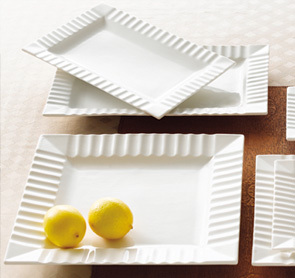 Platter W/ Striped Rim 14"
Square Plate W/ Striped Rim 12 1/4"
Square Plate W/ Striped Rim 10 1/4"
Rect. Platter W/ Striped Rim 12"
Rect. Platter W/ Striped Rim 10"